This post has 7,726 views. My first stop in China was Beijing (北京). 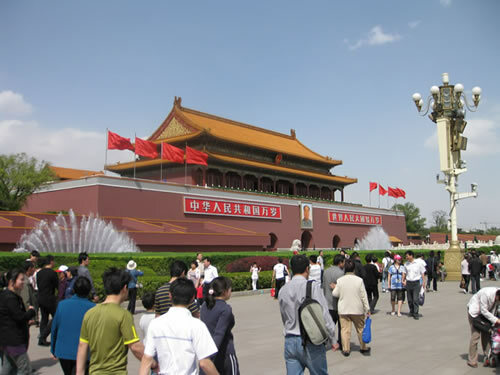 Beijing is of course the capital of China and has been the capital since the Ming Dynasty (15th century). It’s a huge sprawling city with a population of 22 million people, and it is still expanding with tons of developments happening on the edge areas. Other than historical sites and some areas in the outskirts, Beijing is definitely a modern-looking city with a lot of big roads and buildings. It’s a city that screams “BIG”. However, Beijing actually has a surprising amount of greenery around the city, particularly near some of the big expressways. All the trees and plants are probably efforts to beautify the city for the 2008 Summer Olympics. From what I’ve seen, Beijing is made of clumps of dense urban areas or tourist spots connected by a vast network of wide roads and expressways. Despite this well-developed network, you can’t seem to drive anywhere without getting into a traffic jam because there are just too many cars around. Most drivers also don’t follow traffic rules, but pedestrians and cyclists/motocyclists are perhaps even worse. At least cars respect traffic lights (most of the time), which can’t be said for the other groups. While cars have been getting more numerous, bicycles appear to have decreased in numbers, and most bike lanes have been taken over by automobiles. Overall, traffic in Beijing is a mess, and we were wary every time we had to cross a road given that turning vehicles don’t stop for pedestrians. On the other hand, if they did stop then they wouldn’t go anywhere. A better way to get around is the subway which probably has the cheapest fares in the country. For ¥2, you can ride the subway to any of the stops all day long. It’s crowded, but it’s faster than driving. As for the weather, Beijing is pretty warm in May, averaging in the mid 20 degrees Celsius during my time there. It wasn’t not too hot though and might even be a little cool during the night. There are no sand storms in May, but the smog is definitely there. Fortunately for my family, Beijing actually rained a bit during our stay and so the it wasn’t smoggy everyday. When smog was there it was pretty bad though. People with respiratory problems or easily irritated eyes should beware. Being a cultural centre for hundreds of years, there are of course tons of things to see in Beijing, both ancient and modern. I only managed to see a fraction of what’s available, but I think I saw the most notable attractions. Here is a list of places I visited in Beijing. 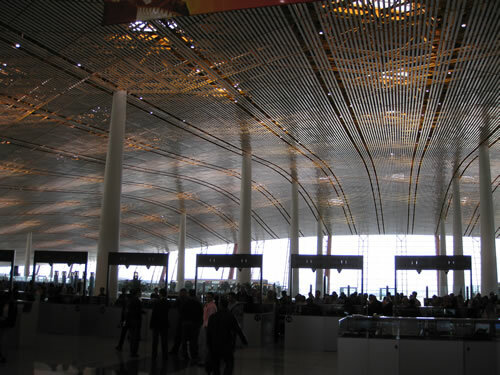 The first place most foreign tourists like me will visit is the Beijing Capital International Airport (北京首都国际机场). As expected of an airport serving such a large and popular destination, the Capital Airport is a huge complex with three separate terminals, and you have to ride light trains to move between terminals. Other than the size, the most of memorable thing about the airport is its curved orange roof accented with white beams. Another notable thing about the airport is that it’s as warm or warmer than the outside even during warm days. This is probably because the huge space inside the terminals makes air conditioning difficult. One of China’s most famous attractions, the Great Wall (长城) is a 6000+ km long defensive barrier first built in the Qin Dynasty (~200 BC) to help protect the country against invasions from the north. 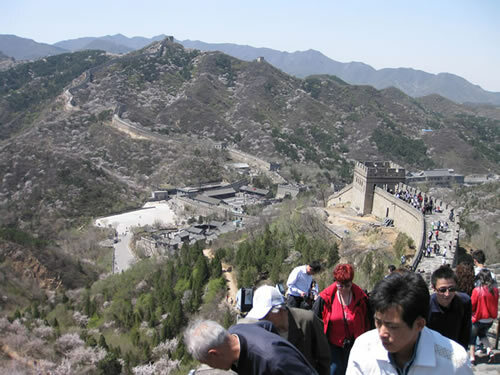 The closest section of the Great Wall is located about 110 km north of the center of Beijing. There are many tourist entrances to the Great Wall. I went to the Badaling (八达岭) entrance, which is one of the biggest and most notable entrances. There is a Chinese saying that states that one isn’t a real man until he has climbed the Great Wall. Well, I’m a real man now . Visiting the Great Wall involves a lot of climbing, since the only thing you can really do at the Great Wall is to climb it. Some of the stairs and slopes are pretty steep. It’s hard to climb upwards, and even harder to come down, so good footwear is essential. It can also be very windy up there. My family (especially me) weren’t in very good shape, so we just climbed up the closest hill and came back down. People can keep walking on the Great Wall as long as they want though since there’s no way someone will walk all 6000+ km of it. 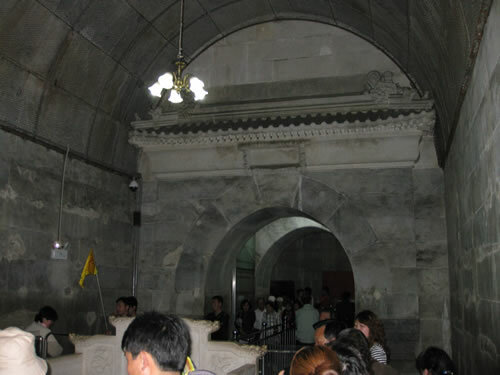 Dingling (定陵) is the tomb of the Wanli Emperor from the Ming Dynasty. Dingling is one of 13 Ming Dynasty Tombs (明朝十三陵) located about 50 km north of Beijing’s urban area, and it’s the only one that has been excavated. 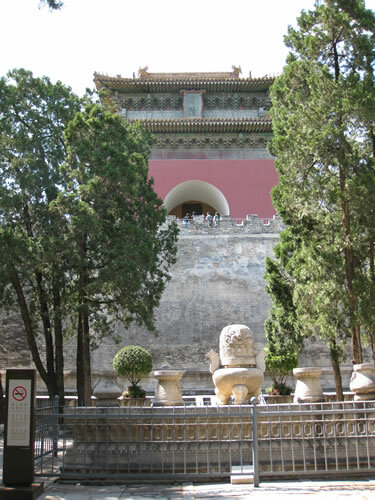 The site contains a underground chamber where the Wanli Emperor and his two empresses were buried. However, most of the artifacts were damaged and lost after the excavation, and nowadays the burial chamber only contains a small number of replicas. It is an impressive place by its own right, but there’s not that much to see when compared to some of the other sites in Beijing. However, Dingling is located near the same highway as the one that goes to the Great Wall, so it’s convenient to visit the Great Wall and Dingling in the same day. 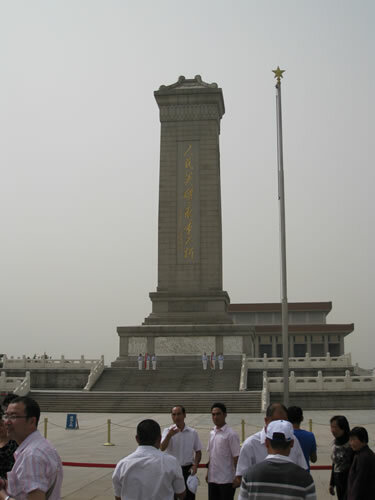 Tiananmen Square (天安门广场) is a big square located at the very center of Beijing. 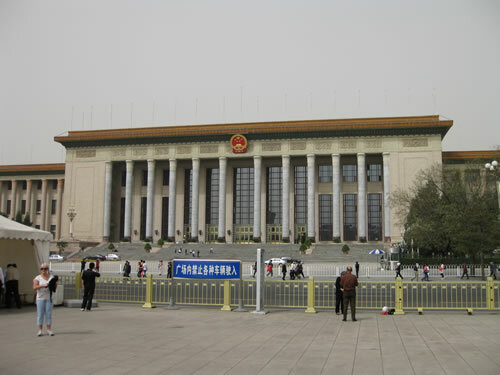 The square contains and is surrounded by many notable buildings and structures, including the Tiananmen gate (天安门), the Great Hall of the People (人民大会堂; main government building), the Mausoleum of Chairman Mao (毛主席纪念堂), the National Museum, the Monument to the People’s Heroes (人民英雄纪念碑), and the Front Gate (前门). It’s pretty much a must-see place for anyone visiting Beijing for the first time. One of the many gates within the Imperial Palace. 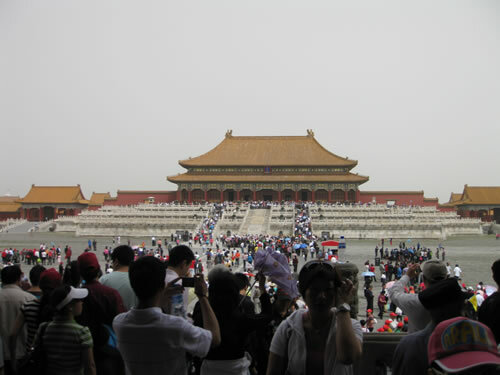 The Palace Museum is crowded place even on weekdays. Just look at all the visitors in the photo. 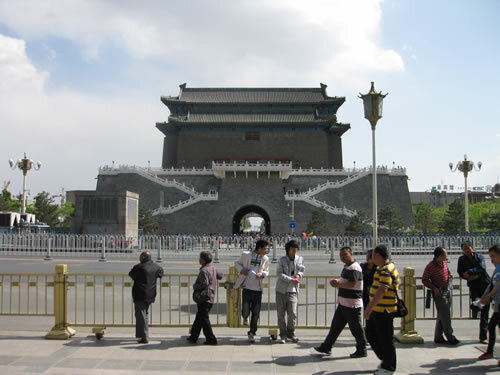 Beyond the the Tiananmen gate lies the Palace Museum (故宫博物院) which is the old Imperial Palace where the emperors lived. 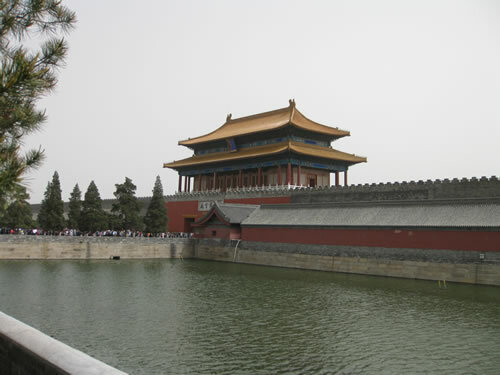 While China has thousands of years of history, the Imperial Palace in Beijing is only several hundred years old, having been built in the Ming Dynasty, and most of the artifacts in the museum are from the more recent Qing Dynasty (1644-1912). The museum is probably one of the most popular tourist sites in Beijing, and the main path is swarming with tourists even on weekdays. 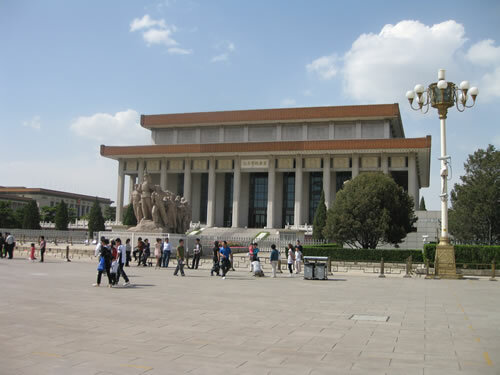 Even though not all parts of the old palace is open to the public, the Palace Museum is still a huge place. One can easily spend a whole day inside looking at the various buildings and exhibits. You can probably go through the museum in about an hour if you stick just to the centre path, but you’d be missing out on a lot of exhibits on the sides of the palace. 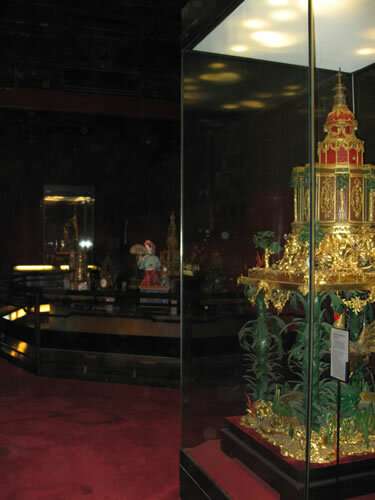 One of the many indoor exhibits within the vast Palace Museum. This one is about western clocks made in the late Qing Dynasty. 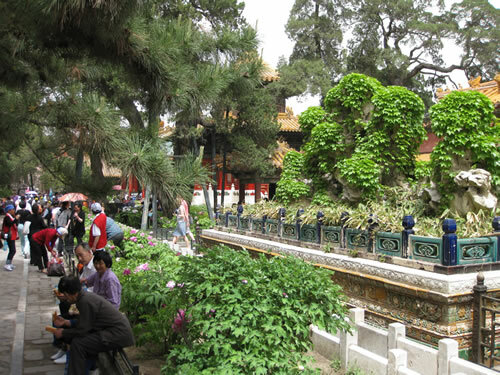 The royal garden within the Palace Museum.